Hot summer days and ice cold slices of fresh sweet watermelon. 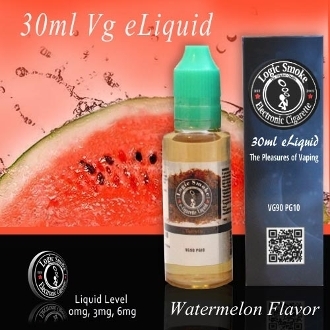 That's the flavor you'll get from Logic Smoke Watermelon flavored electronic cigarette e-liquid. It has a slight hint of tartness that will remind you of those yummy little "happy farmer" hard candies that have been so popular for years. This is truly a tart-sweet treat that vapes perfectly as a stand alone flavor. It also mixes well with many of our other Logic Smoke flavors of e-liquid such as Peach, Blackberry or Apple. Truly one of our best sellers! It just might become your new favorite as well!